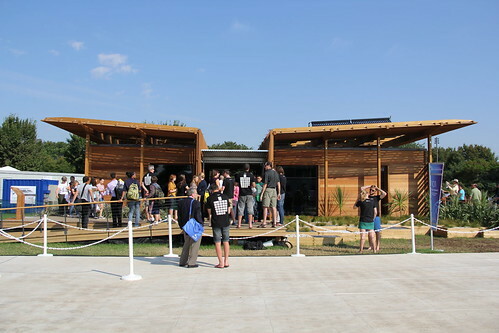 Attending the 2011 collegiate Solar Decathlon in Washington DC this year was a dream come true. Nineteen domestic and international college teams competed to design, build, and operate solar-powered houses that were cost-effective, energy-efficient, and attractive. 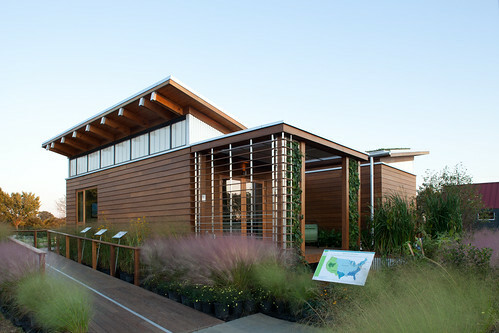 The solar decathlon goal was to build a home under 1000 square feet and $350,000. At $350 a square foot, the cost to go green is quite expensive. Some teams I visited were unable to stay within the budget. The following teams vied for the coveted first place honor. I only had two days to see the above homes. However, given my time constraint, I was only able to see the teams with an asterisk after their names. There were lines to get into the houses, transportation to and from the event wasn’t the most efficient, and they ran out of food necessitating a two hour break to find food. DC isn’t New York City where there is food on every block. The coordination of the event was less than par. Adding to my delay, was my excitement. In each house, I couldn’t stop asking questions. Is that a surprise? I need a full week to get through these houses. University of Maryland took first place in the competition. Unfortunately, I wasn’t able to tour the house. Boy, do I regret this. The team focused on water and energy with their man made wetlands filtering the grey water from the house. In addition, the green roof on the house improved its energy efficiency. Second place went to Purdue. Luckily, I saw this house and gave it a name, Big Box Sustainability Store home. This team bought components that anyone could buy. I don’t want to spoil my upcoming article about this house so I will leave you salivating on how big box meets affordable sustainability. Third place went to the New Zealand team. (Again, a house I didn’t get to see.) They incorporated an indoor/outdoor feeling to their vacation house with a deck running around and through the center of the house. In addition, they used recycled sheep insulation and an innovative drying cupboard rather than an electricity hog dryer. Many of the teams employed their own technology to run their homes via smart phones and iPads. Mitsubishi Mr. Slim split heat pump systems seem to be the “IT” heating and cooling system used by many of the teams. Many of the teams incorporated vegetable plants surrounding their homes to truly create sustainable homesteads. The competition wasn’t just about energy efficiency. Outdoor and indoor space were very seamless integrated into the homes. Streamline and multi-functional spaces were key elements in such small houses. Some teams incorporated multi-functional furniture in their designs as well. Some of the teams designed and built some of their furniture. Some of the homes were designed and built by liberal arts colleges. (This concept blew my mind.) Talk about being thrown into the fire. Passive house design was incorporated in many of the homes I toured which helped to lower the construction costs. Smaller heating and cooling equipment was needed. It’s just smart building, in my opinion. Many of the teams I spoke to expressed how much they enjoyed working with different disciplines. It was all about team work. Many of the team members had already graduated since the project took two years from conception to decathlon. An effort was made to incorporate products manufacturered within their home state. Water seem to be a key element as well. Rainwater collection was a recurring theme in many of the houses. In the next couple of articles, I will be briefly (yes for me) describe my takeaways from the houses. Hang onto your solar hats. Congrats to Maryland! Our RecoupAerator air filtration/ventilation system was part of their watershed project.